My talented husband has turned out yet another beautiful wooden window table masterpiece! Ain’t she a beaut? I love her long legs and egg and dart detailing. This time he let me get ahold of it and distress it to my heart’s content with my new Skil OctoSander and Caromal Colours paint. In case you haven’t noticed, I’m kind of a distressed finished furniture junkie. Smack it up, flip it and rub it down with some glaze, and I’m all over it. So when I discovered Patty Henning’s Caromal Colours blog one day as I was perusing A Soft Place To Land I knew I had found a place I needed to be. I contacted Patty after her ad caught my eye. Once I saw her INCREDIBLE distressed furniture paint jobs I knew I had to get in on some of that action. 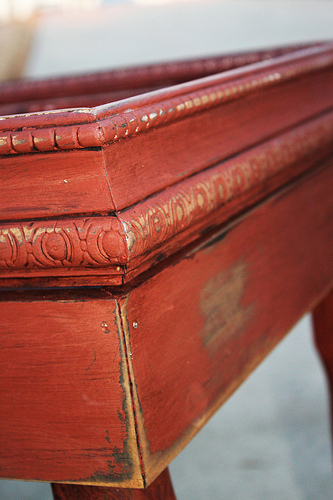 I am a die-hard fan of handpainted and distressed furniture, so this stuff is right up my alley. 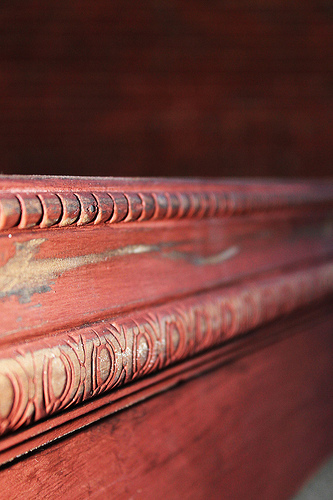 This finish was created using the Paprika color with a Peppercorn basecoat and toner on top. 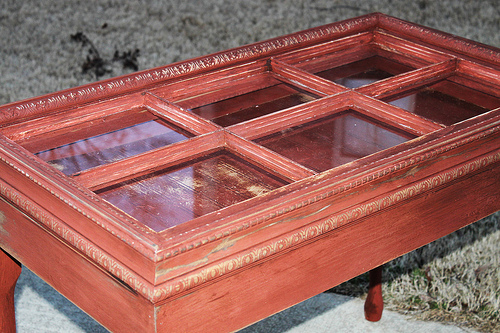 It transformed a brand spanking new piece of wood into something that looks centuries old. The instructions were simple to follow. 5. One final top coat of toner. You could repeat these processes as much as you’d like, but this was the basic procedure. This effect is so awesome to me. I’m totally addicted to this stuff now. The Distressed for Success kit comes with everything you’ll need to create a one-color piece. If you want layers of color, you’ll have to purchase separate colors. I ordered the Paprika, Peppercorn and the Parchment. I’m itching to try more colors now! I love them all!! Be sure to use code PattyH if you want to order! Patty was so very helpful and encouraging to me, and I would highly recommend contacting her if you have any questions about this product. I’m sure she can field any questions about it much better than I could. I’m just proud to show off this new piece. I have a feeling it won’t last very long at our next craft show. With legs like that, who could resist?? If you are looking for a good time table, please let me know! I’d be happy for this table to find a good home with one of you my blog readers. OOOOOOH MYYYYYYY GOOOOOOOOOOOOSHHHH, that is so delicious! 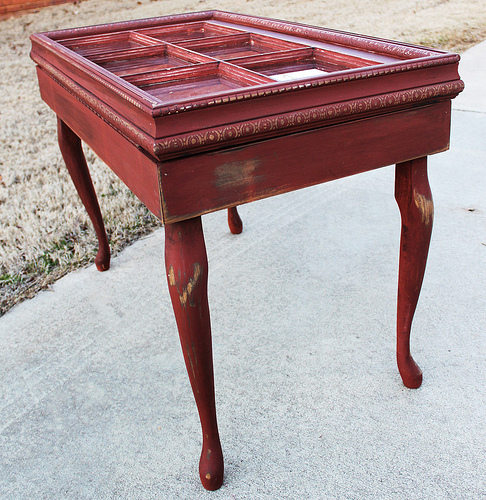 I LOVE the color, and the distressed finish and what a cool cool table! Your husband is very talented as well – he can build them and you can finish them! Beth, that is a very cool table! Great job with distressing & painting. You rock! So fun to hang out with you & all the other girls last Sat. What a great and interesting idea for a table. Very cool. 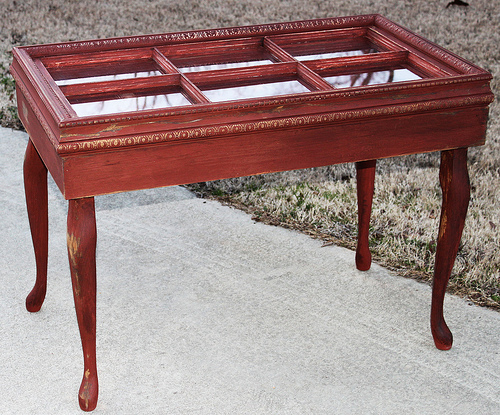 Turned out well–these tables always sell very well for me. love the color and the distressing!